"Thompson Square is one of the oldest public squares in Australia and notable for the large number of Colonial Georgian buildings which surround it. It is the only public space remaining from the original town and has played an important part in the history of the town. 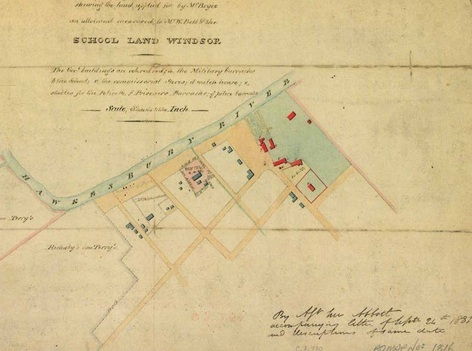 It is the only remaining civic space as laid out by Governor Macquarie and is a vital precinct in the preservation of the early Colonial character of Windsor. The Square reflects Macquarie's visionary schemes for town planning excellence in the infant colony". Quoted in Austral Archaeology, 2011, p140. Thompson Square originated in 1795 and was originally the centre of the village called Green Hills, which was later proclaimed as the town of Windsor by Governor Macquarie. It was formed from a utilitarian public space that had developed to allow access from the ridgeline main road to the water’s edge, as most of the commercial traffic in the fledgling colony was water based. This public space gradually became defined and bounded by Georgian style buildings from the period. The now formalised Thompson Square consists of the central public space (or reserve), the surrounding buildings and the bounding roads. In 1811 Governor Macquarie named this open public space after Andrew Thompson, a 'founding father' of Green Hills (later to become Windsor). Andrew Thompson was transported to the colony for stealing cloth in 1792 aboard the Pitt, but was soon appointed constable at Green Hills by Governor John Hunter in 1796. He was pardoned in 1798 and became a leading emancipist, a highly respected land owner and prosperous businessman, operating a store on the square from 1799. In 1810 Governor Macquarie appointed Thompson magistrate for the Hawkesbury district, the first emancipist to hold this office. By doing this, Macquarie challenged existing social structure, believing that through fair treatment and reward of their hard work, convicts had the ability to become contributing members of society. "The square in the present town I have named Thompson Square in honour of the memory of the good and worthy late Andrew Thompson Esq Justice of Peace & Principal Magistrate for this district, and who may justly be said to be the father and founder of the village hitherto known by the name of Green Hills; there being hardly a vestige of a single building here, except the Government Granary, when he first came to reside on the Green Hills ten years ago." Quoted in Jack 1990, p108. Today, Thompson Square stands as a memorial to a great man, and the birthplace of the Australian ideal of 'a fair go'. George William Evan’s watercolour of the settlement at the Green Hills and the open space soon to be called Thompson Square, dated 1809. 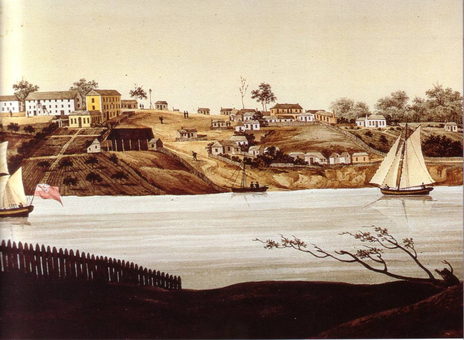 Reproduced in: Barkley, J. and M. Nicholls, Hawkesbury 1794-1994: The First 200 Years of the Second Colonisation, Hawkesbury City Council, Windsor, 1994. Austral Archaeology. (2011). Final Draft Report: Built Heritage and Archaeological Landscape Assessment: Windsor Bridge Options Preliminary Investigation. Roads and Traffic Authority of NSW (RTA), August 2011. Hawkesbury City Council.,(unknown).Explore the Hawkesbury: Windsor Heritage walk Thompson Square precinct. Hawkesbury City Council. Jack, I., (1990). Exploring the Hawkesbury. Kangaroo Press: Kenthurst.